Will you put on the kettle for North West Hospice? Ireland’s Biggest Coffee Morning for Hospice Together with Bewley’s takes place on September 20th 2018. It’s really easy to take part. 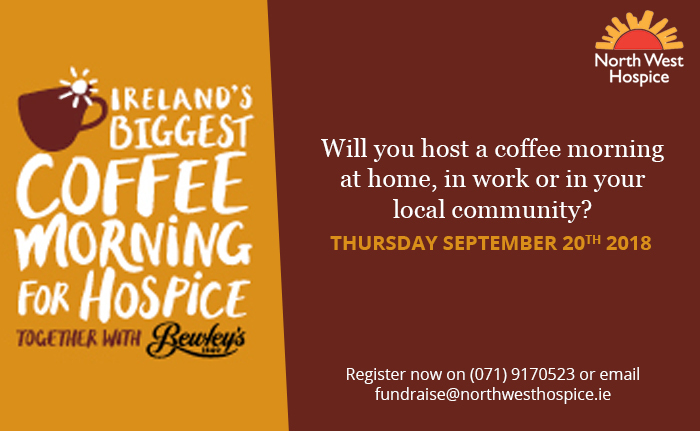 Register to get your free Bewley’s coffee pack online here or call North West Hospice on (071) 9170523. Coffee Morning is the biggest fundraiser of the year for North West Hospice. Funds raised will go directly towards our specialist palliative care service and to support those living with life-limiting illness in our community. To maintain our current level of service, we have to fundraise over €1million every year which is an ongoing challenge. By hosting a coffee morning you can make a difference to people’s lives and help us continue to help our community. Coffee mornings happen in all shapes and sizes: People have them in their own homes with their family and friends or in their workplaces or local communities. All you have to do is register with us here at North West Hospice. Bewley’s will supply the coffee, will you put the kettle on?